Home / Posts tagged "Baby"
The answer to that ridiculous question is no, obviously, but sometimes, my feeling of helplessness in the face of toddlerhood can’t be helped. The baby that so easily opened her mouth to all kinds of nutritious goop, prepared from scratch by her mother with her fancy food processor, is now a picky, finicky, hard to please toddler who is prone to the occasional tantrum if you offer that sippy full of milk one too many times. To say that I have a complicated relationship with food is to say that Hillary Clinton has a complicated relationship with Bill. No, there is no serial infidelity (unless you count me cheating on every diet ever), but there is resignation and recriminations hidden behind of veil of happiness and peppered with occasional bouts of peaceful coexistence. Why am I ascribing human traits to food? It’s complicated, as I just said. But I’m not going to go into it because (1) that would take more space than exists on the internet and (2) I’m not here to talk about me. This is about my daughter. When I learned I was having a daughter and again when she was born, I remember thinking over and over, “Please, God, don’t let her have my food issues.” What and how she eats are what I worry about the most. I want her to be healthy, first and foremost, but I also want her to have a healthy outlook, so that when she’s 8 she won’t cry at the dinner table and when she’s 16 she won’t be too embarrassed or afraid to eat in front of her friends and when she’s 40 she will enjoy an occasional ice cream outing with her kids without fearing it’ll go straight to her hips. I don’t know if this magical head space exists, but if it does, I want her to live in it. I wish I could remember which was the very first book I read. There are four that remain vivid in my mind from my early childhood, but I can’t say with certainty that any of them were the first. 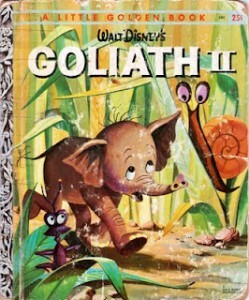 I remember Goliath II, a picture book based on the 1960 Disney cartoon about a tiny mouse-sized elephant; a volume in an encyclopedia my parents used to have that included a bunch of illustrated fables; a collection of stories by Colombian writer Rafael Pombo; and a world atlas. All, I should note, were in Spanish. And all were read many, many, many times over by me or, in the case of Goliath II, by my mom, who would try to skip pages only to be called out by a daughter who had every word of the book memorized. Reading is such an essential part of my life that one of the aspects of parenthood I was most excited about upon learning that I was going to be a parent was introducing books into my kid’s life. I thought long and hard about what should be the first and about how many of my own favorites I could squeeze in before she is old enough to dictate what should be on the reading list. I’ve wondered too how I would react if my daughter didn’t show as strong an interest in books as I did at a young age. Given that hubby and I are both book nerds this seems unlikely, but you never know. I’d like to think that we will be the kind of parents that give her space to foster her own interests, be they related to words, numbers, art, sports or something else I can’t even think of right now. But as she hasn’t learned the words, “Mother, can you please put down that Austen and start reciting multiplication tables,” let’s get back to the books. When I was in high school, a friend of mine once referred to Garth Brooks as “country’s Pearl Jam.” The implication was that pretty much everyone—at least within the genre of country music—liked Garth Brooks, just like everyone liked the band Pearl Jam. This would have been in 9th, maybe 10th grade, a year or two after the release of the band’s debut, Ten. It was one of the first albums I bought on CD, after mom bought me my first CD player in 8th grade, a lunky boom box with detachable speakers that seems positively prehistoric when I consider my first iPod (also a gift from mom). There was no sleek maneuverability, no simple, sophisticated design. It was all awkward functionality with no style, which, oddly enough, also describes me during that era. I was one of the masses who liked Pearl Jam (as well as Eddie Vedder’s remarkable voice and cheekbones). I’ve been thinking about Pearl Jam since watching Pearl Jam 20, the documentary about the band’s two decades of making music, directed by Cameron Crowe, a favorite around here. As always, it’s hard to separate my thoughts of the movie from my emotional reaction to it. First, there’s the obvious “I’m getting old” feeling that comes with seeing a span of time within your own life being depicted as a piece of history, with nostalgia usually reserved for periods long before you were born. Then there’s the music itself, the memories it evokes and the strange satisfaction that comes from having been there at the beginning of something that has endured at least this long, something authentic. The documentary itself is a straight-up bio: the story of how the members found each other, found their sound and evolved over their many years together. It doesn’t really try to reveal any universal truths about music or the “grunge” scene or the 90s, nor about the motivations of Generation X back then or the suburban ennui that alternative music of that era was supposedly raging against (although there are two funny clips in the movie of the recently deceased Andy Rooney, RIP, doing his best curmudgeon, complaining about how the kids need to get over themselves because they really have nothing to complain about). This is the movie’s strength, that it is primarily about the band and their music. And yet while I watched I found myself thinking about the kid I was and the desire to be careless and do stupid things, however clichéd the desire and despite there being nothing in particular at that time for me or anyone to rebel against. I was not one to act on this desire, certainly not in the way it is illustrated in the movie, with band members jumping headfirst into the teeming mosh pits that were their audiences to crowd surf. Still, I related to it. And it was oddly comforting to be reminded of myself as a teenager, perfectly capable of being rash and taking myself and my very tame version of adolescent irrationality very seriously. It was also comforting to be reminded that the pipers of this era of my life turned out to be fairly well adjusted people too, which kind of explains why they made it this far and why they and their music are just as interesting and entertaining now as they were back then. When hubby and I sat down to watch Pearl Jam 20 on October 21, the birth of our daughter was still days away. So our conversation after the movie ended eventually turned, as most of our conversations did in the previous months, to our daughter and, among other things, just what we were going to name her. I noted that if we had a boy in the future, I kind of liked the name Stone, like Pearl Jam guitarist Stone Gossard. He said Stone made him think of Stone Phillips, who is not nearly as cool. Then he suggested Pearl as a complement to Sofia, long the first name frontrunner. We noted that we lived in the neighborhood of the Old South Pearl business district (and we love it here) and that pearl is my birthstone. We didn’t settle on it right then, but when we saw her face for the first time a few days later, Sofia Pearl seemed like the perfect fit. She’s our little precious stone. I wonder if she’ll like her name, and more so I wonder what she’ll think of her parents’ music. There are numerous milestones in life that politely suggest (or scream in your face) that you’re not a kid anymore: earning your driver’s license, graduating from high school, voting, drinking alcohol (legally), graduating from college, living alone for the first time, starting your first full-time job, opening a 401K. The list goes on. I’ve done all of these things and more, and yet some little part of me has always considered myself to still be a kid. I don’t mean a kid at heart, but an actual kid. Someone not able to handle the pressures and challenges of adulthood. Someone who might, at a moment’s notice, call mom and say, “Life is hard. Can you make it all better, please?” That I’ve always known I could turn to my parents for help at the worst of times has been an unshakeable foundation that has allowed me to succeed, bolstered by the belief that no matter how badly I mess things up, I can still go home—figuratively speaking—have a nice dinner and tuck into bed under the same blanket of security I felt when I was 6 or 12 or 17. So what finally has pushed me into the realm of adulthood? Real, grown-up, no-mom-and-dad-to-help adulthood? What finally has shaken that foundation? The knowledge that now it is up to me to provide it. That’s right. Hubby and I are going to be parents. And how could I possibly consider myself still a kid when any day now (I’m 40 weeks pregnant as of this writing) I’ll have one of my own who will insist, nay demand, that I be the mom in the relationship. It’s a little bit scary. 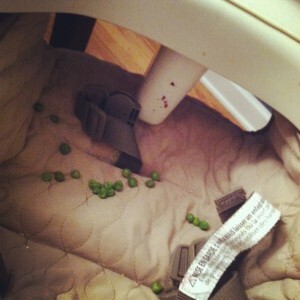 At 33 years of age, I can’t claim that pregnancy and the prospect of parenthood sneaked up on me. Modern medicine allowed me to wait until I was financially and physically ready, in a comfortable, loving relationship. (Indeed, I’ve never been more supportive of contraception and reproductive choice than I am now.) But no matter how long you wait or plan, once the birth—or adoption, for those who go that route—is imminent, it’s hard to convince yourself that you really are ready. Will we be and provide everything our kid needs to be a good, self-adjusted person? One that doesn’t root for Duke or the Raiders? I hope that hubby and I have it in us and believe that we do—as much as I can believe now, while the kid is still safely in her cocoon—because the people who raised us were so good at being parents. So, yes, even now, as I prepare to jump head first into that truly adult state of mind from which even my parents can’t save me, I look to them not for rescue, but for an example. With gratitude, of course, and a little bit of awe.